Since 2007 people have come together once a year to celebrate and remember the life of Jane Jacobs by leading or participating in walking tours of their local communities. As Jacobs argued, walkability is essential for urban communities. These tours seem to be a truly fitting monument to Jacob’s legacy. The walks began in Toronto, but have since spread well beyond Jane’s adopted city, with hundreds of walks scheduled for the first weekend in May in cities around the world. Many topics are covered during these walks, but a lot of them focus either directly or indirectly on local history. The Jane’s Walks provide an opportunity for all our followers to experience firsthand a grassroots history project similar to those discussed in two recent ActiveHistory.ca posts on walking tours and street history. Over the past few years I’ve been on two walks. One in the Don Valley and the other along the Humber River. Both focused on the history of the rivers and their interactions with the city that grew up around them. The Don tour was lead by a friend of mine, Jennifer Bonnell, while the second was led by a heritage activist and community historian. Both tours were great, but very different. 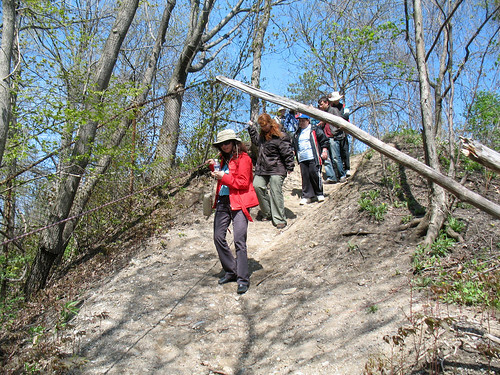 Jennifer’s walk demonstrated her expansive knowledge of the valley discovered by researching her PhD dissertation, while the Humber walk showed just how much a person can know about a region of the city after living in it for decades. Contrasting the two walks reminds me of some of the core values discussed at the Active History conference concerning academics engaging with the community and at the same time listening to community members who have developed their own expansive knowledge of the past. The dissemination of history can and should come from the bottom up just as often as it comes from the top down. This year’s massive list of Toronto walks includes an amazing wealth of historical tours led by an array of university historians, political leaders, and community members. These include the now famous, CAMH: Toronto Asylum Boundary Walls tour led by Active Historian and York Professor, Geoffrey Reaume and a tour of the Black Creek co-organised by our very own Tom Peace. Another friend of Active History, community activist Tim Groves, is leading the tour of the The Ward: A History of Poor People and Immigrants in Toronto. The list of historically themed walks goes well beyond the Active History network. It includes tours led by local historical society members of the Thomson Pioneer Settlement and Queen Street East: The history, the people, the politics. Aspiring politician Karen Sun will engage her community during the Garrison Creek: Exploring It’s Natural and Cultural History tour and member of a residents association will lead a tour called: A Parkdale Village: A Sense of History and Community. All of these tours provide an important reminder that many people continue to value history, even if a lot of us fail the annual history pop quiz about important people and dates in Canadian history. The open model allows just about anyone to develop a Jane’s Walk and it is clear that a lot of people want to engage with their community by leading or following a local history tour. Beyond the walks on May 1st and 2nd, the Jane Walk’s website also has an audio tour of Jane’s Annex. This walking tour allows people to learn about Jane Jacob’s contributions to Toronto and the history of the fight to stop the Allen Expressway from dissecting the Annex Neighbourhood. It has some great interviews with people who knew Jane back in the late 1960s and some recordings of interviews she did during the Expressway campaign. So people celebrate the creator of gridlock? Stupid. She is best forgotten.